The snake is one of the most significant symbols in Hinduism. It is the symbol of both birth and death. Many believe Snake or Naga worship precedes idol worship in Hinduism. Snake worship is believed to evolve from the Naga clan which was part of the Indus Valley civilization. This was in Pre-Aryan times. The Naga culture was later drawn into Hinduism. The snake is also worn around the neck of Lord Shiva, symbolizing his representation of both creation and destruction. Lord Vishnu rests on Adi Sesha, the thousand-headed serpent. Snakes are revered in South India where you will find Naga idols installed in almost all temples and even on roadside platforms. It is believed that any harm done to snakes create miseries and sufferings. The fifth day of any lunar month is considered auspicious for snake worship. According to the Bhavishya Purana, Kadru cursed her serpent sons to be consumed by fire for disobeying her. Brahma, however, softened the curse and sent them to live in the nether regions. This happened on the fifth of the month. Since then lives were spared on the fifth of the month, this day is considered auspicious for snake worship. As a deity, the snake is repented in many forms. One of them being, Naga Devi or Nageswari. 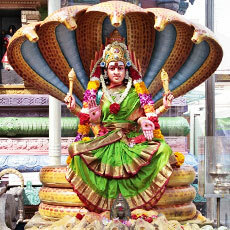 The mother goddess, Nageswari is one of the many manifestations of Devi, symbolizing her willingness topitman from evil.